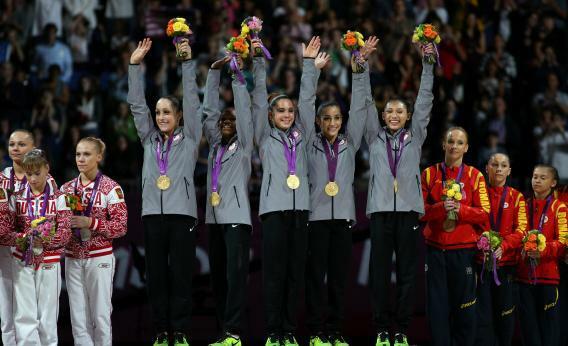 U.S. women's gymnastics team 2012: The Little Girls in Pretty Boxes generation takes home gymnastics gold. Jordyn Wieber, Gabrielle Douglas, Mc Kayla Maroney, Alexandra Raisman and Kyla Ross celebrate on the podium after winning the gold medal. When the American women gymnasts took the team gold in the Olympics in London yesterday, the coverage, and their celebratory interviews were full of references to the Magnificent Seven, the American women who were the last to claim that same championship in 1996, the summer after stars Gabby Douglas, Jordyn Weiber, and McKayla Maroney were born, and just a bit before the birth of Kyla Ross. But while these young women grew up into gymnastics with the sunshine of that victory to guide them, they also came into the sport in the aftermath of something none of the triumphant reporting on their victory mentioned: the 1995 publication of sports journalist Joan Ryan’s Little Girls in Pretty Boxes. Ryan’s sharply critical look at the intersection of international competitive pressure and harsh standards of beauty in women’s gymnastics and figure skating arrived in bookstores at the moment when both sports were reaching new heights of popularity among American audiences. If Jeff Gillooly’s 1994 plot to attack skater Nancy Kerrigan—an attempt to improve his ex-wife Tonya Harding’s chances of qualifying for the Olympics—illustrated the extreme, violent lengths someone might go to in pursuit of Olympic gold, Ryan’s book suggested that quieter and much more permanent damage was routine in both figure skating and gymnastics. Ryan chronicled the accident at the 1988 World Sports Fair in Tokyo in which Julissa Gomez was left a quadraplegic after attempting a Yurchenko vault. Gomez, who eventually died from complications of her injuries and treatment, was not proficient enough to perform the vault, but her coaches insisted on it as a way to boost her potential point total. Ryan devoted another chapter to the death from anorexia in 1994 of gymnast Christy Henrich, who shared a coach with Gomez. If they (and a young Romanian gymnast murdered by her coach in 1993) were the extreme outliers, the larger numbers who developed obsessive compulsive disorder or cutting were no more encouraging. For a nascent young feminist who also thrilled to Olympic skating and gymnastics, Little Girls In Pretty Boxes was to those sports what the debate over chronic traumatic encephalopathy is to football today, a challenge to the idea that they were redeemable. Seventeen years later, the American women have gold medals around their necks again. And gymnastics has made changes. New safety mats and vaulting tables are meant to prevent the paralysis of another Julissa Gomez. The young women who have competed for Team USA in recent years are still tiny, and still young, but they’re muscled as well, rather than notable for their extreme lightness, a quality once prized as the key to higher aerial elements in routines, and a source of major pressure for gymnasts like Henrich. Unlike the waifish Magnificent Seven, the Fab Five have a solidity to them. Feministing writer Chloe Angyal also wrote last year about learning that one of her gymnastics coaches had been accused of sexually abusing her teammates, asking whether the extreme trust that gymnasts must place in the people who teach them to do beautiful but extremely dangerous things in competition endangered them off the mat as well. And even gymnasts who have perfect experiences have short careers. Like in football, the things that make gymnastics inherently exciting also exact a toll on athletes’ bodies. As a New York Times story on 37-year-old German vaulter Oksana Chusovitina and 39-year-old Bulgarian rings specialist Jordan Jovtchev pointed out, that both gymnasts have been able to compete into their thirties, a time when people are still winning beach volleyball championships and scoring soccer goals but long after tissue damage and wear on ligaments and tendons have knocked out most gymnasts, marks them as “genetic freaks,” in the words of a former Olympian. I’m rooting for Gabby Douglas in the individual all-around competition, and I thrilled to see Jordyn Weiber, devastated after Olympic rules kept her out of the individual all-around competition, smile mid-routine as she nailed her first set of tumbling elements. And I’m glad that it’s easier to appreciate gymnastics today than it was around the time they were born, thanks to the conversations sparked by Henrich’s death, by Little Girls in Pretty Boxes, and the 1996 New England Journal of Medicine study that lent scientific weight to Ryan’s reporting. But just because the degree of difficulty is lower than it used to be doesn’t mean that this complicated sport, the men and women who coach these strong young women, and the culture that surrounds them always stick the landing.